Ideally positioned within 5 minutes from the City’s business center, cafes, restaurants and fashion retailers, City Garden is nestled away from the bustle of the city, whilst offering the excitement of an inner-city lifestyle. Designed by award winning Australian Architects PTW, the contemporary 'wave' towers is a striking visual identity of City Garden – unique and timeless yet Vietnamese in character. The design achieves good passive solar orientation, maximizing views, sun shading and integration of landscaping. The 17,000 m² of surrounding green space was designed by Belt Collins, a prestige landscape design company from USA. With their experience, Belt Collins have created a fully integrated, family inspired, landscape design incorporating open lawns, children playground, barbecue gardens, fitness area, swimming pools and jogging paths. + Boulevard 1 Tower (Tower 2A): 30 floors with 165 units, 4 penthouses and 4 duplexes. 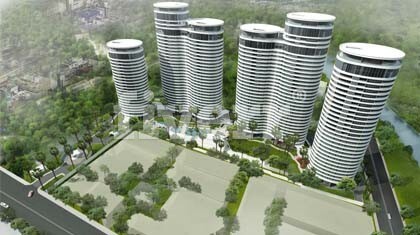 + Boulevard 2 Tower (Tower 2B): 27 floors with 155 units and 4 penthouses. + Green space: The building density is only 23%, City Garden has more than 17,000 m² of green space and amenities providing the fresh air for the community. + Jogging Path: City Garden provides a convenient area for residents to relax by walking or jogging and enjoy the fresh air. + Kinder garten: Will be conducted in Phase 2 with 3 floors. It will be a great place for kids to learn and develop the basic skills and knowledge. + Restaurant, small store, coffee shop, spa….